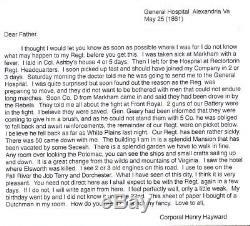 Civil War soldier letter, Corp. Henry C Hayward, 74th New York, General hospital Alexandria VA May 25 (1861) 3 page letter on beautiful illustrated Charles Magnus letter sheet of shield, two horses and flag in oval below which is printed PENNSYLVANIA, to the left is a female figure holding waving flag that says FOR THE UNION. I was taking sick at Markham with a fever laid in Col Ashby's House for 4-5 days, then left for the hospital at Rectortown Regt Hdqts, picked up fast and should have joined my regiment but doctor said he was sending me to the general hospital, was surprised but found out the regiment was moving and they did not want to bother with men who could not endure long marches. Soon Co D from Markham cane in anad said they have been drove in by the rebels. They told me of the fight at Front Royal, 2 guns of our battery were in the fight, believe they were saved, General Geary told they (rebels) were coming to give them a brush, he could not stand with 5 companies so he needed to fall back and wait reinforcements, remainder of regt was on picket, think he fell back to White Plains last night, our regt has been sickly, 50 came down with me. Comes with a full transcript and is very fine, two folds. Residence was not listed; 30 years old. Enlisted on 4/29/1861 at Cambridgeport, MA as a Corporal. On 6/20/1861 he mustered into "D" Co. NY 74th Infantry He was Mustered Out on 6/19/1864 at New York, NY Promotions: Sergt Private 3/1/1864 (Reduced to ranks). Charles Magnus was a print publisher, map dealer, bookseller and stationer working in. 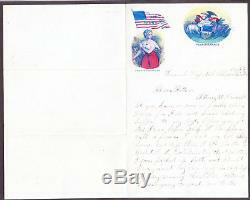 From 1850 to 1899 who issued over a thousand different letter sheets, maps, song sheets, envelopes, and separate prints. His best known works were city views and Civil War related material. Much of his work was copied from other printmakers. He often altered or combined design elements from several sources, rarely crediting the original artist. Many of his works after 1865 were based on photographs, which he often altered, drawing in figures or re-drawing lines for clearer reproduction. Magnus was born Julian Carl Magnus in. And emigrated with his family to. Arriving on August 28, 1848. He worked with his older brother Carl Emil, the publisher of the German language weekly Deutsche Schnellpost, in the early 1850s, learning the printing business. He married Christina (or Christiana, maiden surname unknown), and they had three children, at least one of whom moved to. The images were used repeatedly, with additions of new buildings, bridges, etc. Drawn in to keep the picture current. During the 1850s he also printed and published lithographed maps, often incorporating city views and decorations similar to those in the letter sheets. 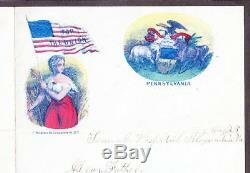 During the Civil War, Magnus produced around 700 patriotic envelopes and over 300 illustrated song sheets. He used images of allegorical figures, battle scenes, political cartoons, portraits and state emblems, frequently using the same images in different combinations. After the war, he expanded his work to include prints, games, reward of merit cards, and advertising and custom printing. Throughout his career, he relied on similar images and techniques. He continued to use the lithographic process and hand coloring even after most printers had turned to photomechanical processes. For all Civil War and paper items. It depends on to what country. We suggest you bookmark it so you can easily come back to our listings at any time. We are a member of the Manuscript Society, the Confederate Stamp Alliance, and life member of the American Philatelic Society. 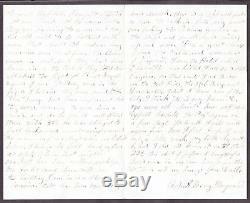 The item "Civil War Soldier Letter Henry Hayward 74th NY Charles Magnus Alex Va 5/25 (61)" is in sale since Sunday, December 9, 2018. This item is in the category "Collectibles\Militaria\Civil War (1861-65)\Original Period Items\Correspondence, Mail". The seller is "antebellumcovers" and is located in Gaithersburg, Maryland. This item can be shipped worldwide.